lips to kiss man and make him suffer. Veronica Lake was born 95 years ago today! What's your favorite performance of hers? This Gun For Hire where she gets to do close-up magic while singing and melt Alan Ladd's beautiful flinty heart. Admittedly she was just miming the magic which was dubbed in post. I would love to sound erudite and say "Sullivan's Travels", but I can't. It's "Flesh Feast". She was great as "Lynn Bracken" in L.A. Confidential. 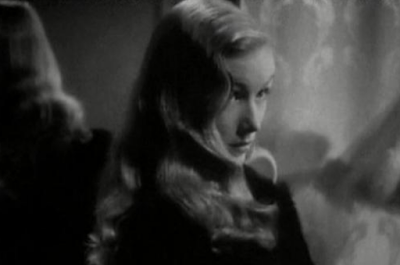 Seriously, though--as a kid watching old movies on TV I was fascinated by Veronica Lake. That hair, that voice! So unlike any other actress at the time. My choice back then would have been easy: I loved I Married a Witch. I still think it's a wonderful, and seriously underrated, movie, but her performance in This Gun For Hire is probably her best. Without question I Married a Witch is her apex. Not only one of her best films but she gets to show the most facets of her talents in it plus she seems to carry a gossamer glow with her throughout the picture. All the time surrounded by an awesome supporting cast. She and Fredric March have great chemistry and seem totally swept away with each other-too bad they absolutely detested each other behind the scenes. A very close runner-up would be This Gun for Hire. The Blue Dahlia, The Glass Key both with Alan Ladd aren't quite at that level but good films (they did a fourth-Saigon which while not dreadful is the lesser of their efforts and obviously done on the cheap). So Proudly We Hail where she's hard as nails and teamed with Claudette Colbert and Paulette Goddard. Ramrod where she rides the range and tangles again with Joel McCrea. The Hour Before Dawn wherein she's a villainess. She's rather pallid in Slattery's Hurricane (with short hair!) but it's a decent little drama with Richard Widmark and Linda Darnell. I can't agree with FDot about Flesh Fest, I found it sad to see her in such a sorry state and the picture is vile. She was a complex, thorny woman with many problems-the root of which would seem to stem from the fact that she was diagnosed as a manic/depressive as a teenager and her mother chose not to seek treatment for her out of the shame and stigma attached to it at the time. If you can ever find her autobiography "Veronica" it's a fascinating if at times forlorn read.